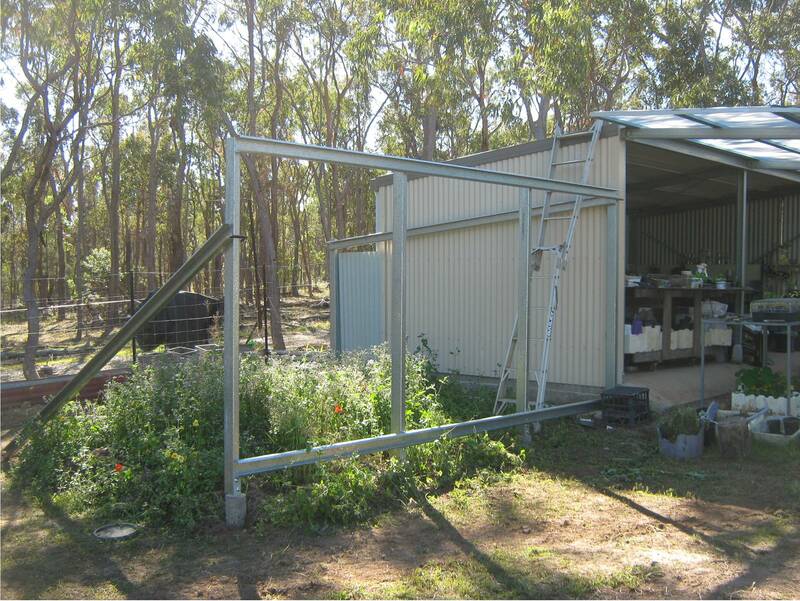 The plan on our home page shows three breeding pens for chooks adjacent to the seeding shed. 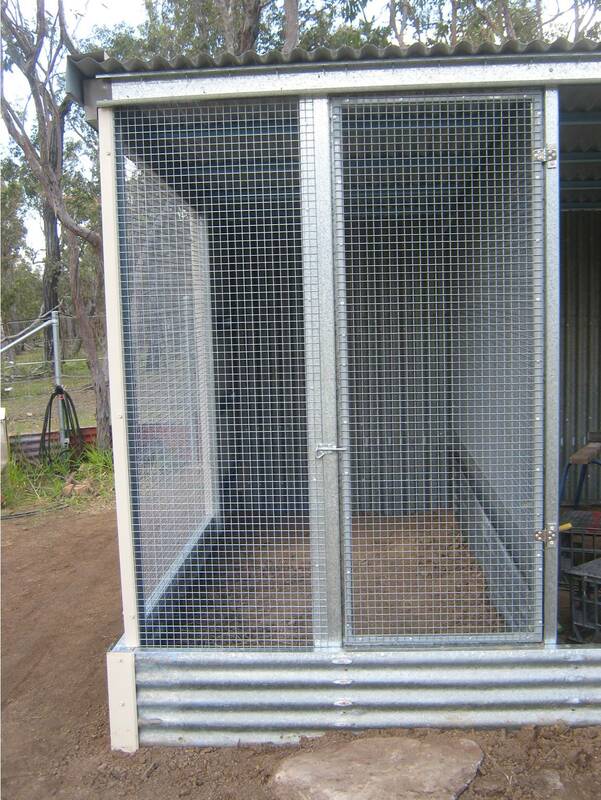 These pens will be for breeding chooks to sell as breeding pairs, and to raise for eating. 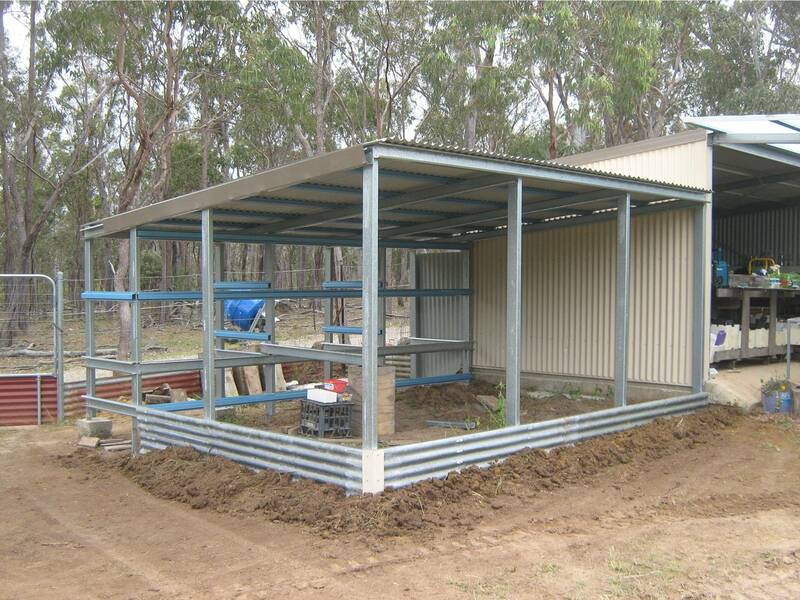 The concept of the pens was done as a drawing sketch with a rough idea of dimensions but mostly we ordered standard lengths of steel and it is being developed as it’s built. It’s kind of an organic development. 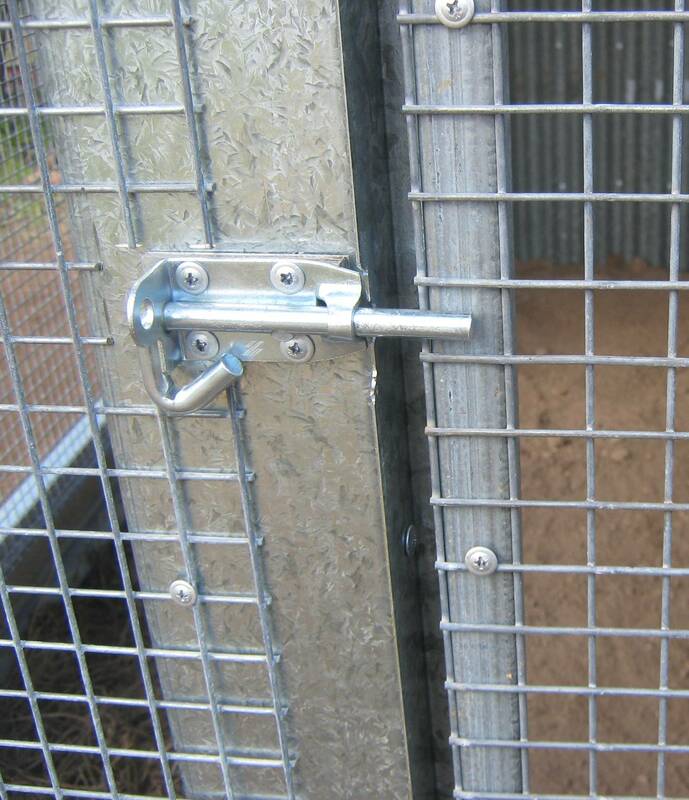 The pens are absolutely dog and dingo proof, python proof, goanna proof, and even rat proof. 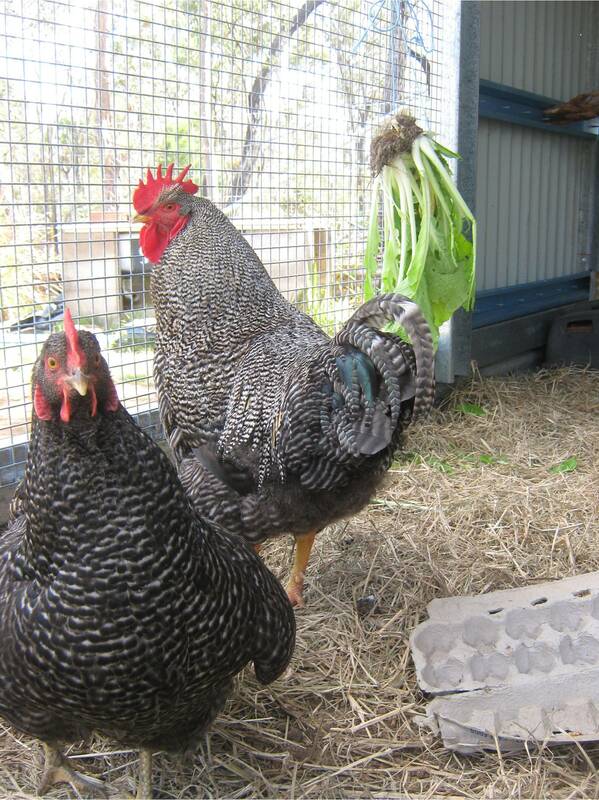 We had two young roosters in the same dome so they had to be separated. 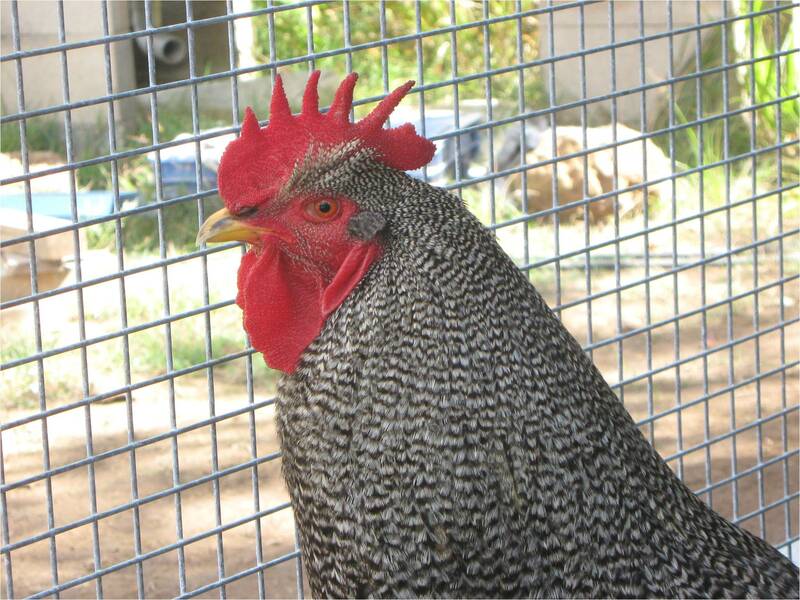 We have eaten the other two roosters, but we are keeping one; Syd, a Sussex boy with a good temperament. He’ll be handy to us in future. 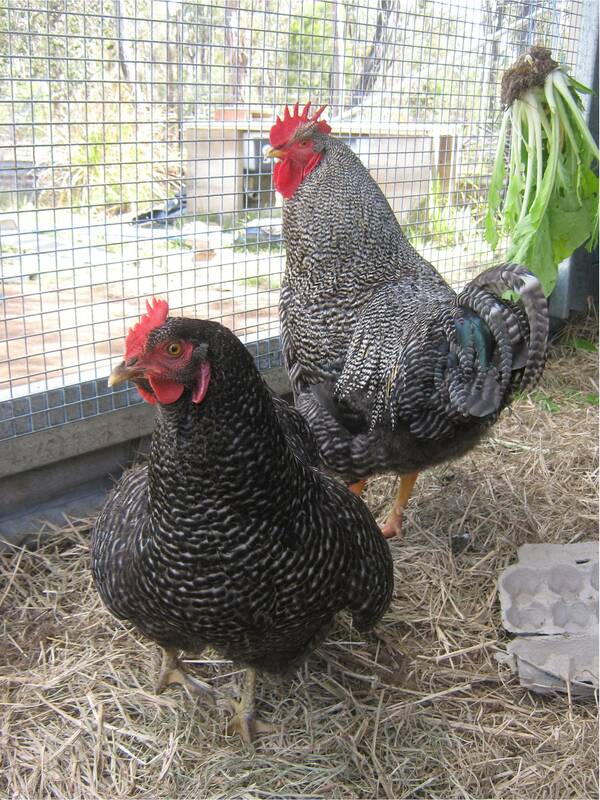 Here’s Percy and Prissy, a Plymouth Rock couple, the first occupants of the new pens. 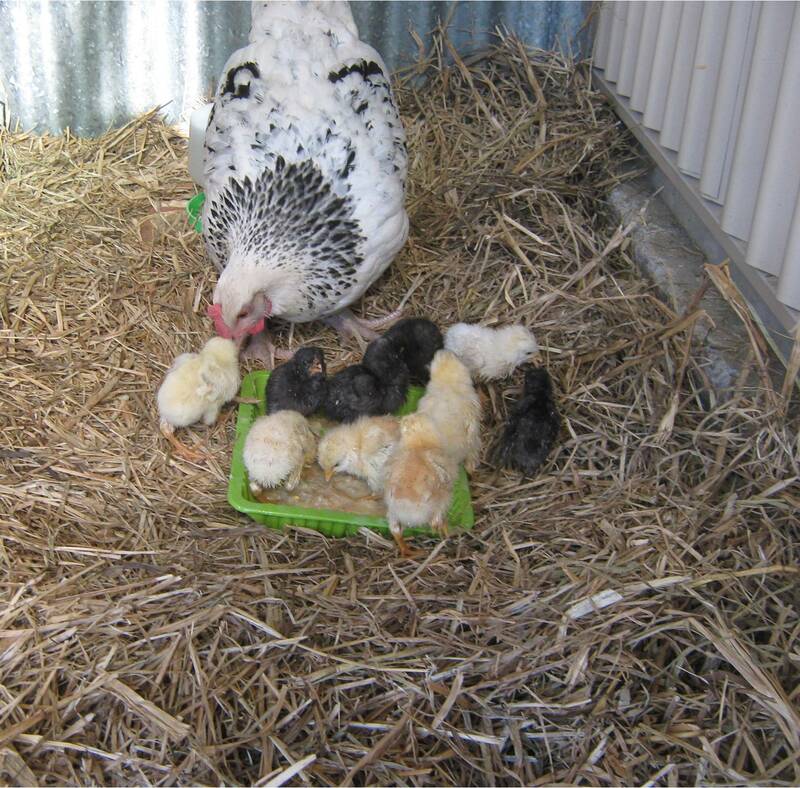 We put some fertile eggs from Percy & Prissy, and also some from Syd Sussex & Red (a Red Sussex hen) under Sparkles, a broody Seabright/Sussex cross, and we now have ten chicks, in the luxury of the new pen. These pens will have a little night house at the rear which will be raised up from ground level and will also have a large access door at the rear for easy cleaning, and a slide out worm farm positioned under the night house floor, so droppings can be scraped straight in. The raised night house also allows for the droppings and hay to be scraped straight into a wheelbarrow parked at the rear. Iron is sunk into ground about 500mm all around. Concrete retaining wall between sheds is 500mm deep. Mesh completed and a flat stone outside the doorway to step on when going in & out in the wet weather. 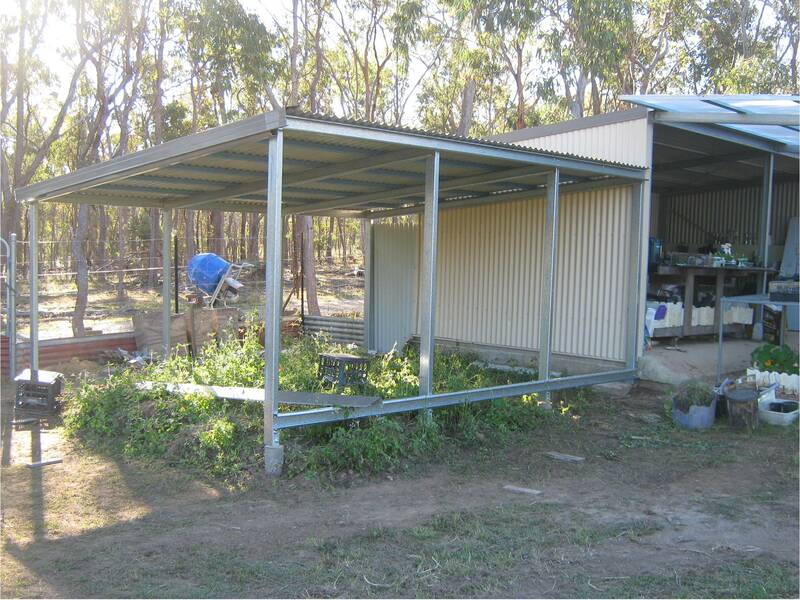 Two more pens are still to make under the remainder of the roof, then start work on the night houses at the back. 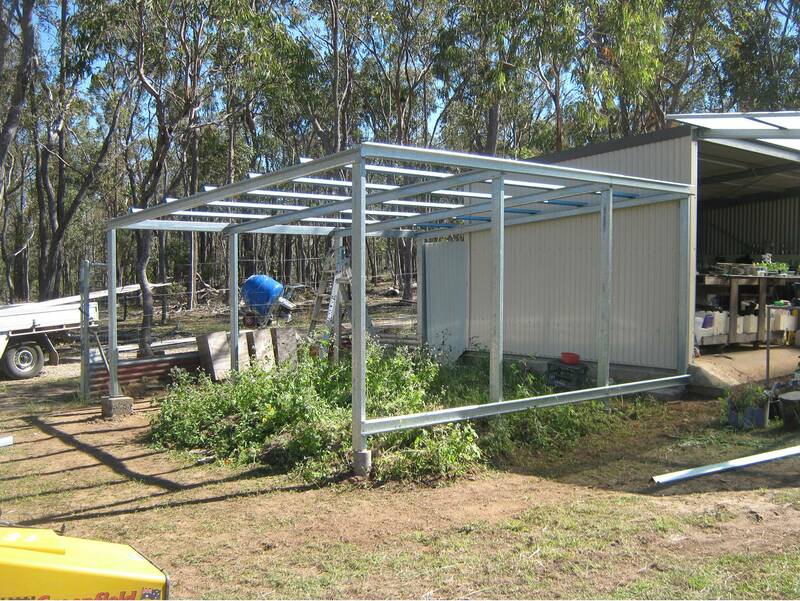 While the steel framing is new, and the roof is new colourbond, much of the rest of it is old colourbond scraps we had around, and the plain galvanised corrugated iron is 1959 vintage from the Ravenshoe town hall which was recently re-roofed. The arcmesh used is 25mm squares and the strands(gauge) are 2.5mm thick. Everything is solidly screwed together. Ain’t nothing gettin’ in! 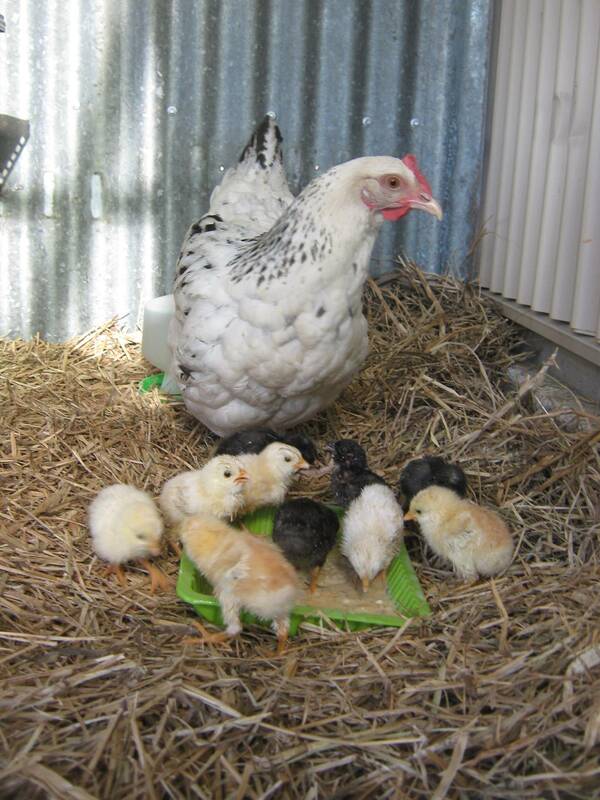 This is necessary because we want a dozen little chicks to run around safe, letting them grow and then either sell or butcher at the appropriate time. 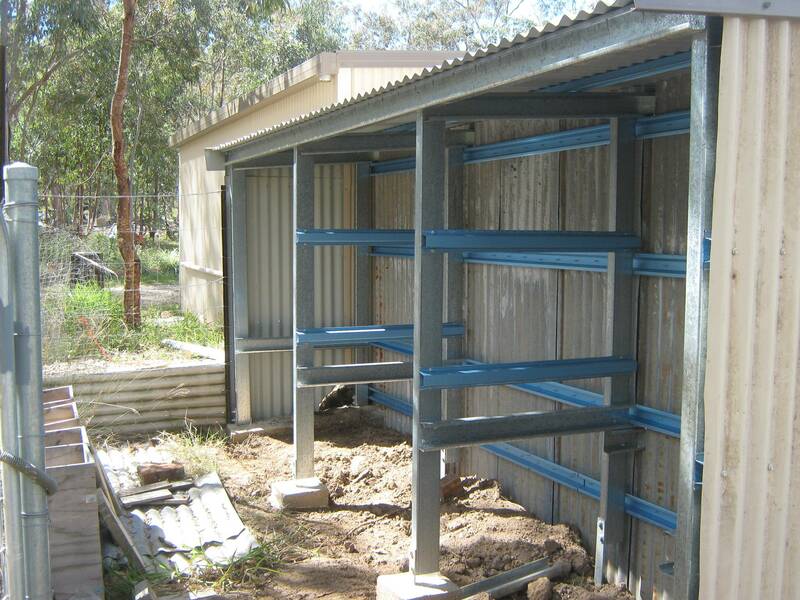 Photos of the rear with all three pens, showing the framework for building the night houses. 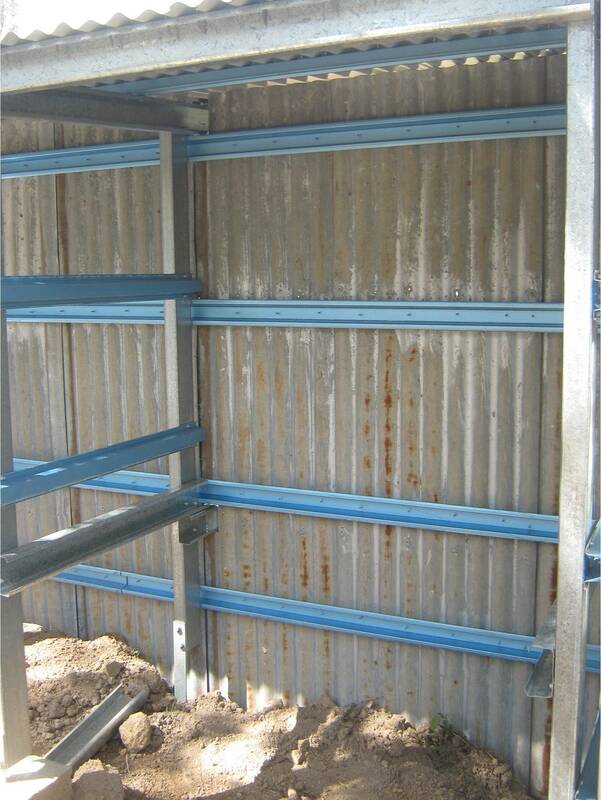 Below is the inside framing of the night house of one pen. Also showing the recycled 1959 corro – the bad side of the sheet, the other side is like new. 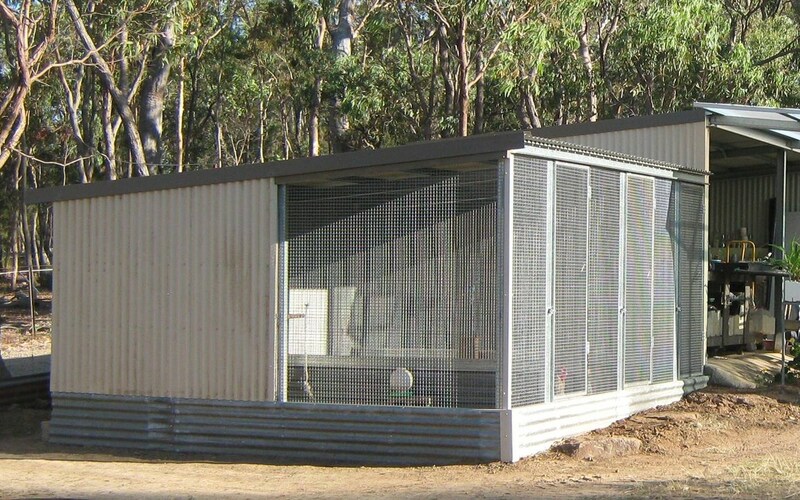 Categories: Building & Planning, Cages & Tractors, Chooks | Permalink.